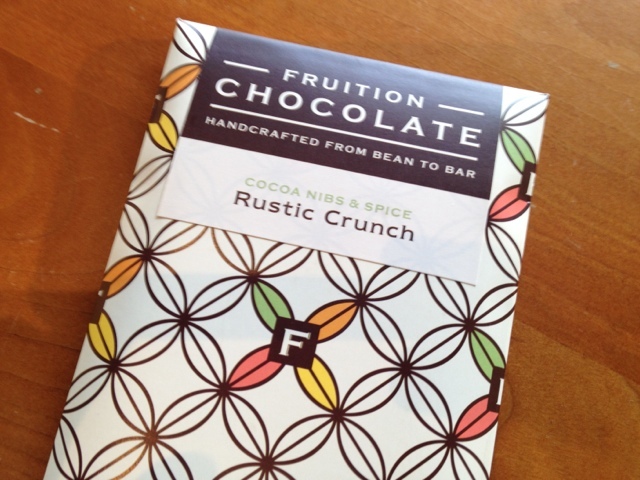 Fruition Chocolate Rustic Crunch. I love the crunch! We had a great Hangout with Bryan of Fruition Chocolate tonight. Thanks so much to Rene Fabre and Bryan Rotherham who joined us and both had great questions. The passion for what Bryan Graham does at Fruition Chocolate shines through as he talks about the expansion of their space and the flavors of their bars and confections. I love to see someone who is excited and enthusiastic about what he is doing! New: Toasted White Bar. He toasts the milk before he adds it to the bar giving it caramel notes and it looked like a bit of a caramel color. Sounds like a white I'd like to try. Limited Release: Autumn Apple. Another white chocolate bar but this one has some inclusions that I've never seen, oats (like granola), apple, cinnamon and nutmeg. Only 100 bars. You'll be lucky if you get one! As I sit here munching on the last of my Rustic Crunch bar by Fruition and ponder his newest bars I've got to admit, this guy really knows what he is doing. He makes bars that are so difficult to put down, I always want more. To me, that is the sign of a great chocolate as well as a talented chocolate maker. P.S. I goofed on the set up of this Hangout (new computer today, and I'm still getting used to it) so this one wasn't recorded. I'm so sorry, but we will have Bryan back soon, I hope really soon!